The Five Points Brewing Company (The Five Points) is based in Hackney, East London, and has been brewing bold, flavoursome beers in a Victorian railway arch since March 2013 under the guidance of Head Brewer Greg Hobbs and Owner/Director Ed Mason. We (Saxon Packaging) have been working with The Five Points since late 2013 when we first designed The Five Points three-pack gift box, which are still in use today. 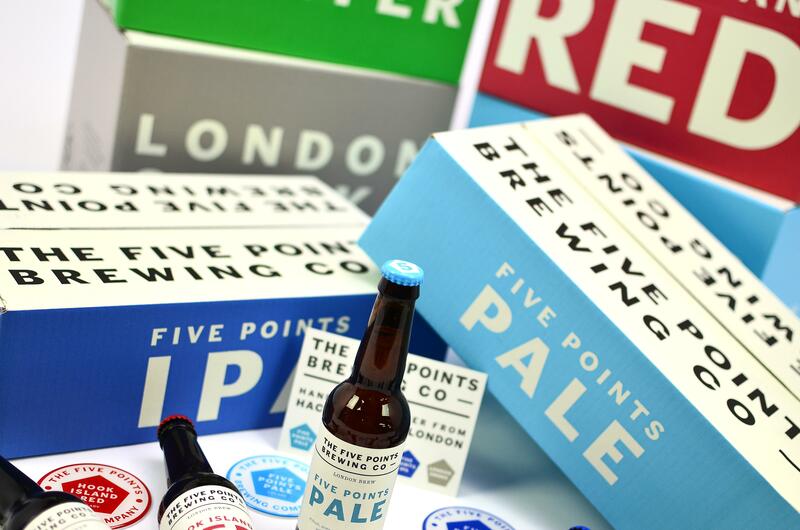 Our in house packaging design team were incredibly adept at interpreting the designs from The Five Points into bold and functional packaging, and this experience meant that in summer 2015 when The Five Points were looking for boxes for their new canned range of beers, we were the obvious choice of supplier. Kate Lyons, the graphic artist behind The Five Points’ visual branding, created the striking visual design of the boxes. The concept behind the design mimics the brewery’s can designs and draws upon the rest of the strong branding for each of The Five Points’ core range of beers. “Kate Lyons has created a clean and classic look that still manages to be bold and eye-catching, yet also contain all the key information such as amount of bottles, size of bottles, alcohol by volume and so forth.” Doreen Joy Barber, Communication, Events & Marketing Manager, The Five Points Brewing Company. Once the visual artwork was finalised, Kate worked with our in-house design team to develop the final box design. Several weeks later the design was deemed so successful that The Five Points extended the design onto their bottle boxes as well. We referred to the Pantone colours from Kate’s artwork and the existing branding of The Five Points, and provided samples of the ink to be featured on the packaging. The process of getting the colours exactly right involved extensive consultation with Ed Mason and Greg Hobbs, including sending copies of the brewery’s bottle labels to the ink supplier in order for them to match the tone directly. Previous experience allowed us to specify an exact grade of material for the boxes. Due to the cans generally being damp when being packed, a kraft inner liner and a waste based fluting was recommended to help deal with the moist packing conditions. Printing onto a white substrate ensured the chosen colours remained bright and bold. The bottle boxes remained in the same grade as the original packaging albeit they were switched to a white outer liner to make the most of the colours once more. With the cream being printed first, we added additional wax to the ink recipe to ensure it dried in time before the 2 additional colours were laid down to prevent ink rub across the design and ensure a quality print finish. Close attention was also paid throughout the printing process to ensure colour registration remained spot on and the correct printing pressures were applied. The slightest adjustment in pressure can have a drastic affect to the overall print colours and quality. Through careful material choice, spot-on matching colours and clever design, we have achieved stunning results with the branded boxes through simple flexo printing methods. “Having supplied Five Points Brewing with their previous 2 colour brown boxes, we were really pleased that we were chosen to work on their new boxes. The finished design and results ensures their packaging remains consistent with their overall brand look and feel. 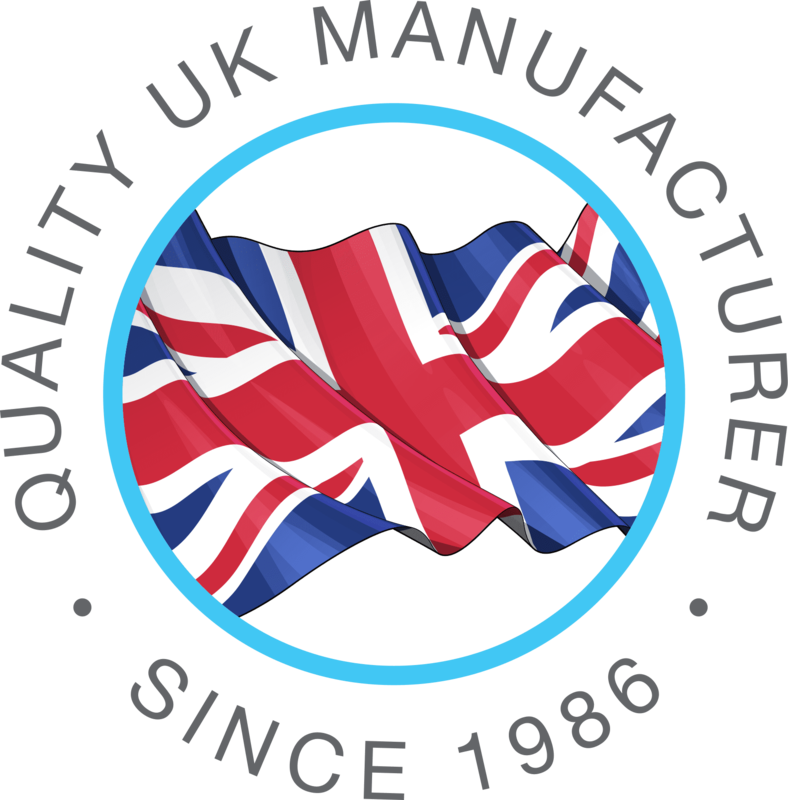 The print process we used was also a very economical solution given the number of designs” Mike Impson, Sales Director, Saxon Packaging Ltd.
“We are incredibly pleased with the finished product. The packaging reflects the design and does a great service to the beer within!” Doreen Joy Barber, Communication, Events & Marketing Manager, The Five Points Brewing Company. 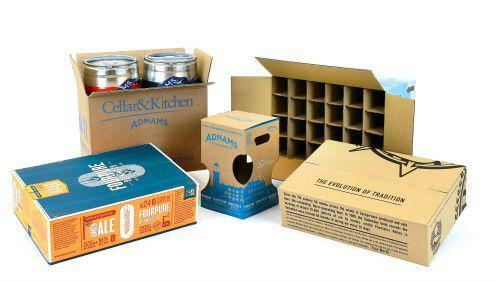 Interested to know more about our beer packaging solutions? Click here or call 01502 513112.